Remember Wario Land? Well I do, and man we NEED a new Wario Land. Forget F Zero and Metriod; THIS is the series that I want to come back. 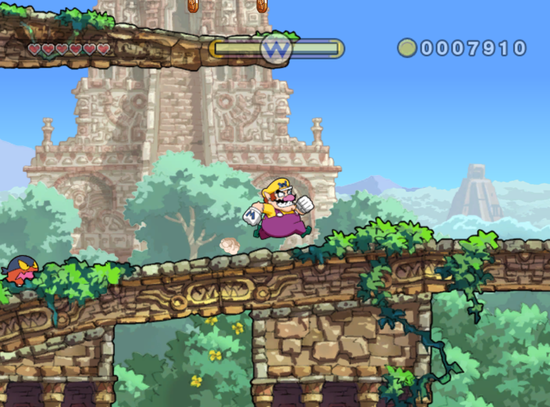 Wario Land is a series of platformers that sometimes delve into puzzle platformer, for the case of Wario Land 2 and 3. These games may have you doing different tasks or whatever, but they’re all related in one special way. It’s not about saving a princess or concurring evil; Nope they’re all about Wario making bank! All of the games are about you just getting treasure; heck in the case of Wario Land 1 it’s mandatory! Honestly this is really refreshing; sometimes I just wanna look out for number 1, not save an entire realm from evil (Well, you kinda do that part by accident, but I digress). Let’s talk about the “newest” Wario Land game, Wario Land: Shake it!, or in PAL regions Wario Land: The Shake Dimension. The Title Screen of Wario Land: Shake It! Wario Land: Shake It! was released in 2008 for the Wii and put on the Wii U eShop in 2016. It was developed by the folks at Good-Feel and published by Nintendo. The story is that Wario (what a surprise) goes into The Shake Dimension to get the legendary treasure of the realm; The Bottomless Coin Sack, and any other scraps along the way (Oh and to save the queen and all of the inhabitants of the dimension from being imprisoned by the evil Shake King, but that’s more of a side goal for Wario). Just the standard story here; move along. The game involves you jumping, shoulder-bashing, throwing, ground pounding your way through; the works for a Wario game, but now with 100 percent more shaking of the Wiimote! This is a Wii game after all, and it’s an unspoken rule that every game made for the Wii had to have at least some motion controls. Sure it’s fun to shake a coin bag till it spills it’s contents everywhere the first 200 times, but then (like the subtitle says) your wrists start hurting. I had to stop playing for a while so I could ice the things so they wouldn’t hurt! Maybe that says more about me than the game, but the point still stands. All the levels are varied, each with their own little challenges like “Don’t take any damage” or “Collect X amount of coins”, and three big treasures to collect; just a little something extra to do for the avid completionist. Sure the game is a tad bit on the short side, but it’s still a fun ride nonetheless. The first non tutorial level; Stonecarving City. Oh man, let’s talk about the visuals and the audio! The game uses a nice looking hand drawn art style, which complements the cartoony nature that all Wario Land games have. The background are drawn back hand and all unique from one another, making all of the levels stand out more . The sheer amount of work to make this game look the way it does is absurd. Wario alone has over 2,000 frames of animation drawn for 200 actions, which is crazy! The music is a treat to listen to. The game has a great mix original tracks, like Foulwater Falls and Just Plains, and remixes from other Wario games, like Stonecarving City (No, he didn’t get his Smash Bros. victory theme from Stonecarving City; Stonecarving City got it’s music from his victory theme.) and Glittertown (A remix of Greenhorn Ruins from Wario World), for example. This soundtrack; heck, ALL Wario games’s soundtracks are severely under utilized in other Nintendo games (I want a remix of Greenhorn Forest in Smash, dang it! I will not rest until this happens!). All in all; this is a great addition to any Wii collection. What more can I say about the game than; It’s a Wario game. Wario games are just dang fun to play, even if you do hurt yourself playing them (I would be looking at you Virtual Boy Wario Land, but I am now blind after playing you for too long for a time. Thanks for that. ).